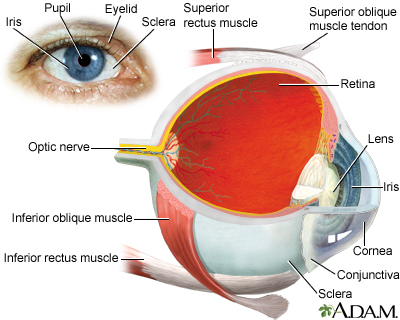 The retina is the light-sensitive layer of tissue at the back of the eyeball. Images that come through the eye's lens are focused on the retina. The retina then converts these images to electric signals and sends them along the optic nerve to the brain. The retina most often looks red or orange because there are many blood vessels right behind it. An ophthalmoscope allows a health care provider to see through your pupil and lens to the retina. Sometimes photos or special scans of the retina can show things that the provider cannot see just by looking at the retina through the ophthalmoscope. If other eye problems block the provider's view of the retina, ultrasound can be used. Schubert HD. Structure of the neural retina. In: Yanoff M, Duker JS, eds. Ophthalmology. 4th ed. Philadelphia, PA:Elsevier Saunders;2014:chap 6.1. Yanoff M, Cameron JD. Diseases of the visual system. Goldman L, Schafer AI, eds. Goldman-Cecil Medicine. 25th ed. Philadelphia, PA: Elsevier Saunders; 2016:chap 423. The eye is the organ of sight, a nearly spherical hollow globe filled with fluids (humors). The outer layer or tunic (sclera, or white, and cornea) is fibrous and protective. The middle layer (choroid, ciliary body and the iris) is vascular. The innermost layer (the retina) is nervous or sensory. The fluids in the eye are divided by the lens into the vitreous humor (behind the lens) and the aqueous humor (in front of the lens). The lens itself is flexible and suspended by ligaments which allow it to change shape to focus light on the retina, which is composed of sensory neurons.